Strategically located in the heart of the Rickenbacker area, which is one of the North American International Freight Center’s most vibrant logistics hubs, Rickenbacker Global Logistics Park (RGLP) and adjacent developments provide more than 75 million square feet of distribution space. With capacity for at least 30 million square feet of expansion near cargo-dedicated Rickenbacker International Airport and the Norfolk Southern Rickenbacker Intermodal Terminal, the area provides outstanding opportunities to grow your distribution and manufacturing base with supply chain assets that are already in place. Five campuses and development opportunities for millions of square feet of additional distribution space, Rickenbacker Global Logistics Park tenants can easily access the park’s air, rail and trucking facilities. Geographically, Rickenbacker is located within a one-day truck drive to nearly half of the U.S. population and one-third of Canada’s. International businesses also find Rickenbacker a prime location since the opportunity to obtain Foreign-Trade Zone status allows them to defer, reduce and eliminate customs duties. Conveniently located within a few miles southeast of passenger-focused John Glenn Columbus International Airport, Rickenbacker is attractive to both domestic and international businesses. 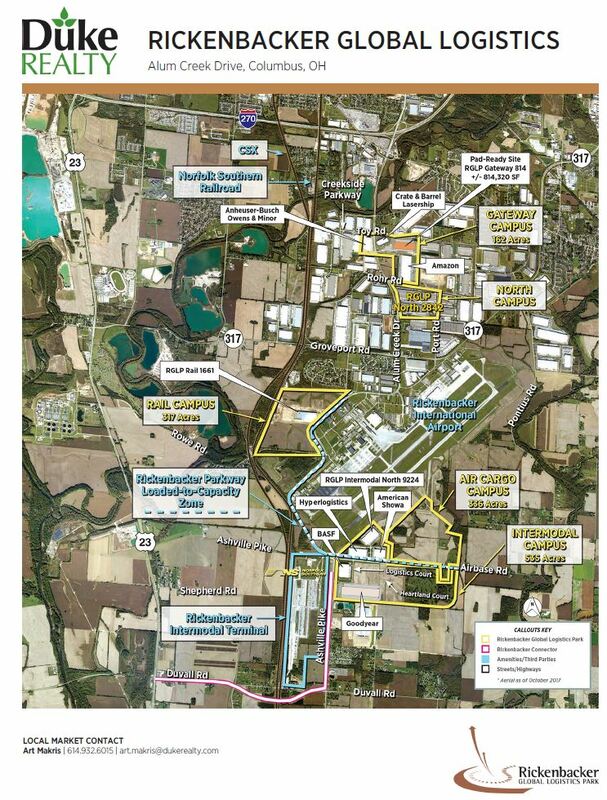 The Columbus Regional Airport Authority is developing the Rickenbacker Global Logistics Park (RGLP) in collaboration with Duke Realty Corporation and Capitol Square Ltd.
For detailed information about land and leasing opportunities within RGLP, contact Duke representative Art Makris at 614-932-6015. Situated around Rickenbacker International Airport, Rickenbacker Global Logistics Park benefits from the highly collaborative Columbus Region, which offers a smart workforce, a growing economy and an elite collection of logistics assets known as the North American International Freight Center. Expand your business at Rickenbacker's attractive airside or landside properties. Administered within Rickenbacker International Airport, Foreign-Trade Zone 138 helps Columbus Region businesses compete globally and strengthen their supply chain.